A mellow blend with a soft and friendly disposition. Roasting this blend of specially chosen Latin American beans for a shorter time allows the delicate nuances of soft cocoa and lightly toasted nuts to blossom. Mellow and flavorful, this coffee brews a delightfully gracious cup that’s perfect for welcoming friends. With its calm and laid-back character, this coffee pays homage to the art of porch-sitting. 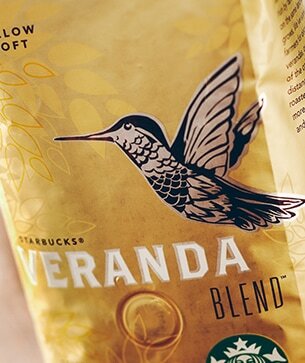 Named for the serene terraces decorating towns and neighborhoods throughout the regions where these beans were grown, Veranda Blend™ is a gentle and inviting cup best served with a sunny day, a good friend and nothing in particular to do. Light-bodied and mellow. Subtle with delicate nuances of soft cocoa and lightly toasted nuts.